A tour of some of the most beautiful beaches in the North of Sardinia that have been awarded the famous Blue Flag, a new opportunity to discover other magnificent beaches where you can lay out your towel and relax! If you can’t choose between the many beaches in the North of Sardinia or you’re looking for new ones during your holiday on the island, Delphina recommends the definitive F.E.E. selection, an international organization that since 1987 (European Environment Year) has awarded the Blue Flag to the most beautiful beaches in 48 countries worldwide. The North of Sardinia with its beaches of fine white sand and crystal clear waters has received an incredible 13 of these awards all along the coast at places like Palau, La Maddalena, Santa Teresa Gallura and Castelsardo, a new entry for 2015. It is not just the natural beauty and environmental quality of the beaches, but also the facilities available and the sustainable management of the area, which means that these are all safe places to visit. Everybody knows that during a holiday in the North of Sardinia, a boat trip to the islands of the La Maddalena Archipelago is an absolute MUST for discovering the most secret little bays in this unique natural park (now the International Park of the Straits of Bonifacio – just 10 minutes by boat from the Hotel Capo d’Orso and from the Park Hotel Cala di Lepre). Alternatively, you can get to the Island of La Maddalena with your own car to discover the beaches where the famous Blue Flag is flying. We take the “scenic route” starting from the East coast of the island where we find the Spalmatore beach, particularly sheltered from the winds and with all the facilities. Its name comes from the ancient sailors’ habit of bringing their boats here to “spread” (spread-spalmare ndt) pitch on the hull. Shortly after we come to Porto Lungo or “Cala Lunga” as the locals call it, a small beach with emerald green water famous for being close to Porto Massimo. On the Western side of the island we find the beach at Monti d’a Rena, which is worth a stop just to run down the dunes and dive into the transparent crystal clear waters. The beach is also a favourite spot for sports enthusiasts who do windsurfing and underwater activities. 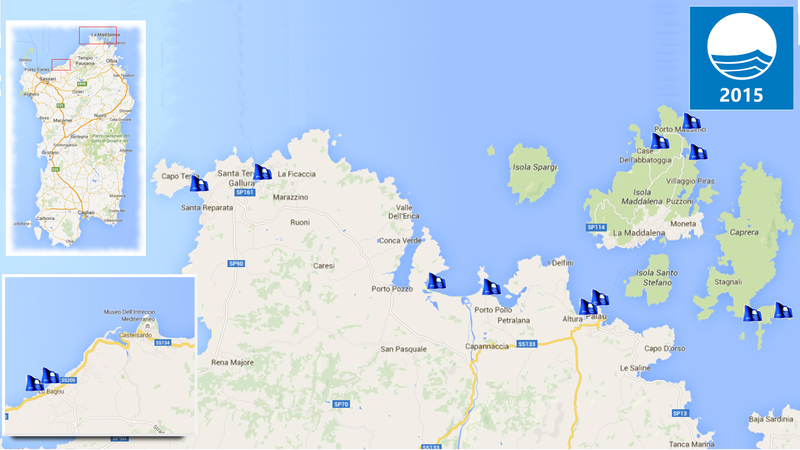 Our discovery of the Archipelago’s Blue Flag beaches continues on Caprera which has recieved two awards. One of these is for the fine white sandy Relitto beach which is famous for the fact that an old boat landed and stayed here and all that remains is the wooden skeleton of the hull, while the other is for the Due Mari beach with its shallow sandy bottom and washed by a crystalline sea. We get back on the ferry and head off to the mainland where we disembark at Palau, a lively tourist centre in the North of Sardinia about 35 kms from the provincial capital of Olbia. Here too Nature has created little paradises of soft white sand that disappear into transparent crystal clear water. Four beaches here were awarded the Blue Flag in 2015: Palau Vecchio, in the centre of the town, perfect for enjoying a few hours of relaxation or having an invigorating swim to avoid the summer heat, the Sciumara, a long sandy beach on the outskirts of town, the ideal destination for families with children or those who enjoy going for long swims. If however you are looking for less crowded beaches with all facilities even during the height of Summer, you can opt for the Liscia beach, which stretches for about 2 kilometres along the coast as far as Santa Teresa Gallura. Instead water sports enthusiasts have no doubt: the beach at Isuledda-Porto Pollo is the perfect place to do windsurfing, kitesurfing, SUP, sailing or just enjoy a cold drink at one of the many bars along the beach. Our journey now heads West: we arrive in Santa Teresa Gallura (just 10 minutes by car from the Resort Valle dell’Erica), a typical small town that looks out over the Straits of Bonifacio and which saw the re-awarding of its two Blue Flags from last year for Rena Bianca and Rena di Ponente at Capo Testa. The first, which can be reached from the centre of town and which has all the necessary facilities, is famous for its extra-fine white sand and shallow water, while the presence of tiny fragments of coral in some places gives the beach an enchanting pink colour. The beach at Rena di Ponente is on the isthmus that leads to the Capo Testa peninsula a few kilometres outside the town. With its lighthouse and a spectacular panorama that becomes magical at sunset, this is one of the most delightful places in the North of Sardinia. A visit to this ancient town (about 20 kms from the Resort Le Dune) built around the base of the Doria castle can be combined with a little relaxation by the sea. Just a few kilometres from this scenic town is the village of Lu Bagnu, which boasts two Blue Flags: the Sacro Cuore – Ampurias beach and the Madonnina – Stella Maris beach, golden beaches with fine grain sand and shallow sandy water perfect for childrens’ games and activities.